How my implants got inside of me. There are only pictures for the cross in my hand and the 8 beads in my arm, pictures were not taken during my other two implant procedures. 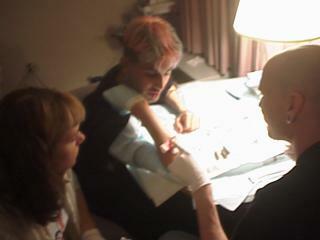 Steve Haworth (man in Satan's Cheerleader shirt) is the perosn that does the implant procedure. You can find out more about him at BME. 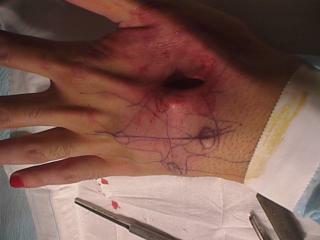 This is the back of my left hand. 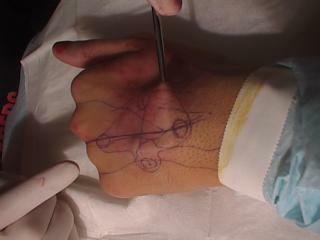 The incision was made as small as possible on the inner side of the cross. 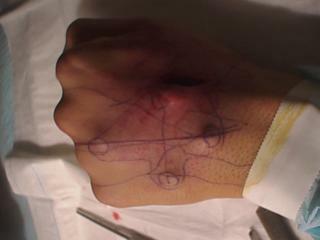 The lines drawn on the back of my hand indicate where the cross will sit when complete, and where the outer layer of skin needs to be detached from the layer below it. 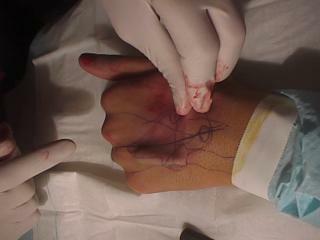 Veins in that areas are also marked for extra caution. 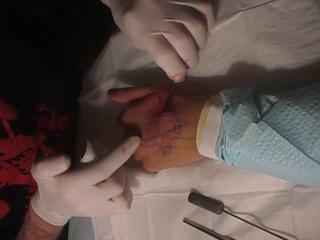 7 stitches were made to close the incision. This is my outer right forearm. 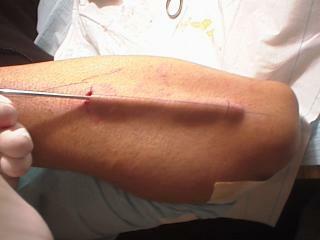 The incision was made in the middle of arm, and the skin was seperated up and down the entire length of my forearm to insert 8 teflon hemispheres. 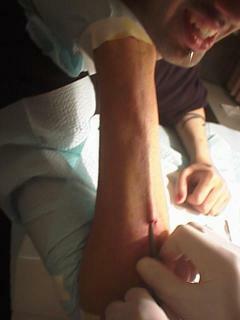 3 stitches were made to close the incision. Luckily I was fed candy to keep me awake.